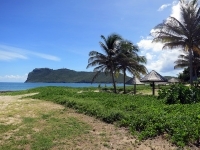 St Lucia's second largest town is on the south coast, adjacent to the island's busy Hewanorra International Airport on the southernmost tip of the island. At St Lucia's most southerly point just outside the town is the Cape Moule, a Chique Lighthouse, which offers one of the best panoramic views of the island. The town has a beach called Anse de Sables which is popular for windsurfers. Near the beach is the Maria Islands Interpretive Centre, which contains a small natural history museum and an office where visitors can book trips to the Maria Islands about half a mile offshore.